A win, three podiums and the championship lead – YES!! 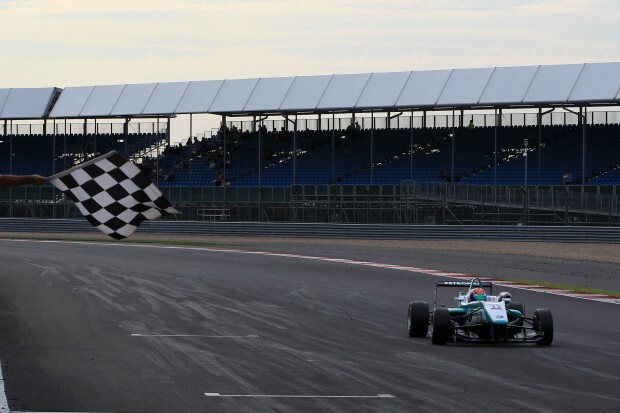 Jazeman Jaafar celebrated three podium finishes at Silverstone circuit this weekend, with the 19 year old Malaysian taking his third British F3 win and two second place finishes to regain the lead of the Drivers’ Championship. It was a fitting location for Jaafar to show such great form, after the young Malaysian had this week been confirmed as a British Racing Drivers’ Club Rising Star, the first Asian to have achieved this recognition. His achievements also brought him further success, being presented with the Mobil 1 Master of the Weekend award for his strong overall performance. Jaafar started his race weekend with a dominant practice day performance, heading the timesheets in both the morning and afternoon sessions. With a well-balanced car and plenty of pace, he headed into qualifying. After an intense 30 minutes qualifying session the young Malaysian had posted plenty of laps with his quickest two counting for the third race grid (fastest lap) and first race grid position (second fastest lap). His lap times put him second on the grid for both races. The first race of the weekend, with blue sky and an unseasonably warm Silverstone, promised plenty of drama and didn’t disappoint, although it was an agonisingly long race for Jaafar, after the final results were decided in the Race Stewards’ Room. As the five red lights went out signalling the start of the race pole sitter, Alex Lynn was quick off the line and Jaafar was convinced that he had jumped the gun. Jaafar slotted into second place with one of his four team mates, Carlos Sainz, behind in third place and Jack Harvey, in fourth position. With Lynn a considerable distance ahead straight off the line, Jaafar was never able to get close to wrest victory, but after the 15 lap race he finished in a comfortable second place. Behind him the fight for third place was race long, with Harvey stealing it from Sainz to fill the final podium slot. It was only after the race that the Stewards reviewed the track action and confirmed Jaafar’s conviction that Lynn had been too eager off the line, as had Harvey. A 30 second penalty promoted Jaafar to his rightful place and a worthy winner of the Silverstone opener. Harvey was also penalised, closing up the gap between the top three drivers in the championship title hunt. Felix Serralles, finishing seventh dropped from leading the championship to tieing with Jaafar for second place. Jack Harvey retook the lead, but just three points ahead of Serralles and Jaafar. Jaafar said after the result had been confirmed, “I was absolutely certain that Alex (Lynn) had jumped the start, so I was very deflated when there wasn’t a drive through penalty issued to him during the race and I think I showed my frustration with a very half-hearted celebration on the podium. I’m very glad that the Stewards reviewed the race footage and realised that I was right and corrected this to give me the victory I deserved. It’s a great shame that I couldn’t have had my moment on the top step of the podium, but ultimately, it’s the win and the championship points that are important, so I’m very happy now”. The next day the British F3 field reconvened for the second and third races of the weekend and once again, more controversy. Jaafar started from ninth place and had moved up to seventh place by the first corner and sixth position by the end of the lap. As the race settled, it was Serralles leading, Lynn in second and Harvey in third place with Jaafar in fourth. When Lynn spun in avoidance of an off-line Serralles , Jaafar was quick to benefit, taking third place and holding it to the chequered flag. Once again the final results were decided in the Stewards room, with second place finisher, Harvey, deemed to have caused a collision with Pipo Derani on the opening lap. His actions prompted a 30 second time penalty on his results which put him down to tenth place. This promoted Jaafar to second place in the final standings. Harvey was also dealt a 5 place grid penalty for the final race of the day for another driving infringement which Jaafar hoped would keep his title rival behind him over the final race distance. After the second race of the weekend, the title chase had closed up with Serralles leading on 272 points, Jaafar five points behind on 267 points and Harvey in third on 256 points. The PETRONAS Talent Programme driver started the third race from the front row of the grid, alongside pole sitter, Alex Lynn. Both drivers had a good start with Lynn edging out Jaafar in the first few corners, but Jaafar fought back and passed his rival to claim the lead. He quickly tore away from the chasing field, building up a gap of 2.5 seconds, but as the race progressed Lynn made a comeback from fourth place up to second and then started to hunt down Jaafar. The Malaysian was struggling with tyre degradation, fending off attacks from Lynn, but finally succumbed to him with just two laps left of the race, so he crossed the line in second place. Meanwhile, his two title rivals were fighting over seventh place and with a strong points advantage with his second place finish, Jaafar was delighted to retake the lead of the British F3 Drivers’ Championship. The current points standings puts Jaafar 6 points ahead of Serralles, with Jaafar on 282 points and Serralles on 276, closely followed by Harvey lying in third with 259 points. The tenth and final round of the 2012 British F3 International Series take place at Donington circuit from 27-29 September.